* The FBI should return a copy of Notebook 4010, relating to Flask 1029, the so-called “murder weapon”, to USAMRIID so that it may be uploaded as required by FOIA « CASE CLOSED … what really happened in the 2001 anthrax attacks? This entry was posted on December 12, 2017 at 3:17 pm	and is filed under Uncategorized. You can follow any responses to this entry through the RSS 2.0 feed. You can skip to the end and leave a response. Pinging is currently not allowed. To whom did Ivins provide additional spores on June 1, 1998? It is not listed on the inventory control sheet for Flask 1029. To make things easier on the overworked and underfunded (and presumably well-meaning) FBI FOIA personnel, perhaps they could just provide the attached pages 44, 45, 41 and 50 referenced in the 302. “The dog ate my homework” is especially lame in Amerithrax. We specifically identified where Lab Notebook 4010 — the contemporaneous notes relating to the so-called “murder weapon” — could be located. In the case of Lab Notebook 4010, the FBI is not incompetent. The senior FBI employees are provably LYING when they say the requested documents have been uploaded or cannot be found. Such notables as Gregory Koblentz (August 7, 2009) and the New York Times’ Scott Shane (December 22, 2010) have filed FOIA requests for Notebook 4010. But the FBI removed Notebook 4010 from USAMRIID and has refused to return it despite repeated requests, according to the USAMRMC FOIA Officer. The FBI did selectively produce 30 pages of the 88 page Notebook 4010 to the NAS and I snagged it from the NAS materials. A Special Prosecutor is sought. The FBI has failed to give back Notebook 4010, the laboratory Notebook relating to the so-called “murder weapon” Flask 1029. It was never cleared for disposal. If a Special Prosecutor is appointed, his appointment should extend to consideration of other instances where the FBI has lost or destroyed records it should have preserved — or where it simply is playing hide-the-ball on an important issue. J.Edgar Hoover accepted Richard Nixon’s application to the FBI in 1937. Then his acceptance was cancelled as “not qualified.” Why? Why was Richard Nixon’s FBI application rejected? If FBI had not released the documents, we would never know the story. That’s awkward. The FBI Director will release his own (reportedly classified) notes but not the unclassified notes of Bruce Ivins, who needed his notes to defend against the FBI’s theory that he had was a murderer. Does former FBI Director Comey now agree that his notes were classified? (i haven’t been following the issue). Does he have a legal theory excusing their release? Comey testified that he believed his personal memos were unclassified. Comment: It seems reasonable to infer that his copies were not stamped classified. Amerithrax was Mueller’s biggest “whodunnit.” Many critics, me included, think the case was botched. So the President would have done well to direct FBI Director Wray to ensure that the FBI complied with FOIA in regard to Amerithrax. Mueller was the first to admit that Amerithrax was riddled with conflict of interest — it was the nature of the small field of anthrax researchers at the time. (As an example, the FBI’s chief scientist JE is the one who made a dried powder out of Flask 1029 and this was kept from the public until I drew JE out and we got him on film setting the record straight. I think Mueller’s solution of compartmentalization was in good faith (and certainly he is highly experienced in complex criminal prosecutions). At the same time, I agree with former lead Amerithrax investigator Richard Lambert’ criticism that it likely would prevent Amerithrax from being solved if people only saw pieces of the puzzle. I think in the end that is what happened — but what, in fact, happened, under any theory, has still not been persuasively established. I personally advocate only for the rule of law on both Amerithrax the hot button issue of Donald Trump’s campaign and Presidency — though like Tribe, not Dershowitz. My own view is that the FBI reached a mistaken conclusion but I haven’t seen that any outside critic could have done better in real time; people often will disagree about a whodunnit or mystery. Then Ivins’ suicide threw a monkey wrench in the course of the investigation and any prosecution. Bannon remarked mockingly: “The three senior guys in the campaign thought it was a good idea to meet with a foreign government inside Trump Tower in the conference room on the 25th floor – with no lawyers. They didn’t have any lawyers. Last month it was reported that federal prosecutors had subpoenaed records from Deutsche Bank, the German financial institution that has lent hundreds of millions of dollars to the Kushner property empire. You will be SHOCKED to know why the FBI employees are withholding it. As the former lead Amerithrax investigator Richard Lambert told the New York Times and Fox News, the FBI is withholding a staggering amount of information exculpatory of Bruce Ivins. And this was FBI Director Mueller’s biggest case. If the FBI is to be understood to stand for the rule of law, this notebook should be produced without further delay. This is significant. 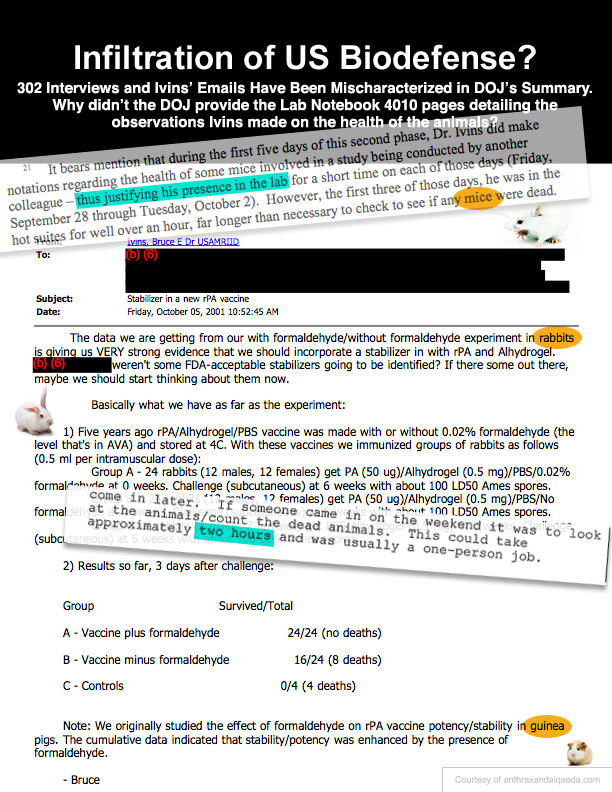 Flask 1030 was genetically similar to the anthrax used in the mailings — but from this entry, we see that it had been used up in the animal challenge prior to March 17, 1998. “The RMR 1029 spores have been stored … in the B3 cold room (walk in). Of course, where Ames was — and when — is of key relevance to analysis of the distribution of the Ames. Thus, the FBI’s withholding of the vast majority of Notebook 4010 is not just unreasonable, it is outrageous. At page 84, he identifies the name of the person at the Michigan Biologic Product Institute who asked him to make some B. anthracis Vollum 1B spores for him on agar media. In a June 1, 2000 entry, he identifies the individual at Bioport Corporation to which he shipped the Vollum 1B spores. And then at 96-97 he includes documents from the RUSSIAN FEDERATION, Ministry of Health, State Research Center of Applied Microbiology. 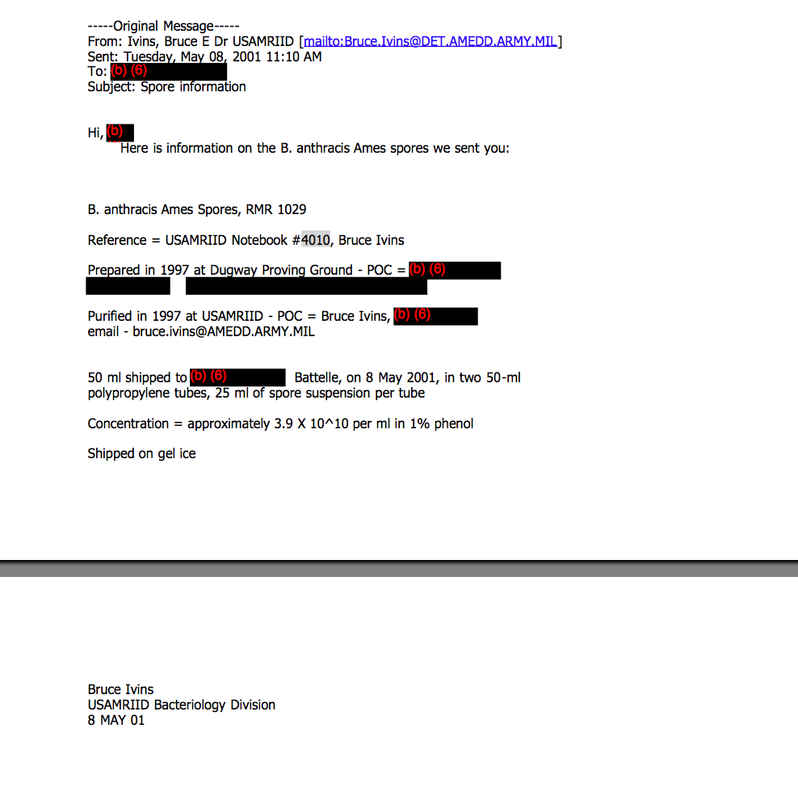 The FBI was in serious violation of FOIA when it did not return a copy of the CD with Ivins’ notebooks to the USAMRMC, when USAMRMC FOIPA Sandra Rogers first requested it. As the originating agency, it is the USAMRMC/USAMRIID has the expertise to redact it pursuant to the statute. Moving forward, with DOJ counsel involved that understands FOIA, things should be set on the proper course moving forward. The mailed anthrax was NOT grown on New Sporulation Media (NSM). One advantage of obtaining Ivins notebooks detailing the culture medium used was to exclude particular anthrax. Moreover, Dr. James Buran had directed the culturing of BA on various types of growth media. The purpose of the initiative was to determine whether or not the nutrient medium contributed to the finding of the tin, silica and iron in the spore coat of the mailed anthrax. The notebooks are exculpatory of Bruce Ivins. The FBI cultivated its “Ivins Theory” out of thin air. Typo: That’s Burans, not Buran. Seeing the notebooks also is instructive as to the number of plates needed to grow the anthrax. An FBI Special Agent attempted to replicate the culture, harvest and drying methods potentially used by the suspect. [Even the word “suspect” in the forensic update perhaps, to some, is revealing; the author’s use of “suspect” perhaps refers to Hatfill when read in context]. Gram quantities of anthrax spores were used. (Each letter contained 1-2 grams). The FBI Special Agent’s study found that approximately forty (4) 150 mm plates would be required to produce EACH gram of dry processed spores. (You can refer to the National Academies finding to see if in total 450 plates were needed; I don’t have it in front of me). This avenue of inquiry — this important forensic “Silicon Signature” of the mailed anthrax — makes a review of Bruce Ivins’ notebooks all the more important. He and his technicians were NOT using silica in the growth medium. Instead, that was done at the DARPA Center for Biodefense where Ali Al-TImimi shared a suite and computers and fax machine with the Ames anthrax researchers Ken Alibek and Charles Bailey. (See their patent filed Spring 2001). (Bailey was former acting commander of USAMRIID). Famed Russian bioweaponeer Ken Alibek’s company, Advanced BIosystems, had the biolevel 3 work done at Southern Research Institute in Frederick. (Former SRI officials Voss and Franz decline to say when SRI first obtained virulent Ames, but it provably had supposedly avirulent Ames long before the mailings. (see unclassified contract documents). Dr. Bailey in 2001 once told the press that he was not going to mention the use of silica in making a bioweapon because he didn’t want to give terrorists any ideas. (Forget floatability; it serves a different purpose; “if I told you I’d have to kill you”). The trouble was that the office of a supporter of the jihadis was only about 10 feet away from Dr. Bailey when he said the words to the reporter. Dr. Al-Timimi was sentenced to two life sentences — plus 70 years — for discussing the plans of some young men who wanted to go abroad and defend their religion. About all Ali did, for all I know, is tell them that if they were stopped at the airport to ask for their mom and cry like a baby. So it seems that his sentence was awfully harsh — perhaps some analysts were concerned that he had access to DARPA bioweapons technology. His appeal — 12 years later — is being heard this year, I believe, on the grounds that the FBI withheld information about his fellow Falls Church imam, Anwar Awlaki, the now dead guy who has urged that Al Qaeda attack in a massive anthrax attack. John Ezzell, the FBI’s scientist at USAMRIID — and the longtime friend and colleague of the science squad scientists — consulted with DARPA and was the one who made a dried powder out of the Ames in Ivins’ Flask 1029. (But he did not use silica and there seems no reason to think the powder he made would have shown such a signature). (John gets credit for coming forward and answering quite a few questions on film at a conference organized by Dillon and moderated by Lew; Dr. Ezzell deserves major props). Given all the extreme conflicts of interest that riddled the FBI’s forensic investigation, the FBI should comply with FOIA. It’s not too much to ask given US cities still face a mass anthrax attack. As another example (just one of many) of potential bias or interest in the matter constituting a potential conflict, the DNA work was being done by Les Baillie, who had innocently hosted infiltrator Rauf Ahmad, Ayman Zawahir’s spy sent from Pakistan. Rauf Ahmad helped design Al Qaeda’s lab and was protected by ISI; the interrogating FBI and CIA agents were served tea and cookies by a servant at the ISI safehouse under Rauf Ahmad’s direction. Ha! Another example was that the lead criminal prosecutor, Seikaly, had a daughter who represented Ali Al-Timimi pro bono. The prosecutor’s sister-in-law and brother argued that Bin Laden was not responsible for 9/11. As another example of potential bias or interest in the subject matter, Jason B. had been the bacteriology collection scientist at ATCC (which shared the GMU facilities with Alibek and Bailey). So while we can credit everyone’s good intentions, and I blame only Ayman Zawahiri (planner), Yazid Sufaat (processor), and Adnan El-Shukrijuah (mailer), we should not be blind to how bias may have guided the investigators and the scientific inquiry. It is analogous to the Trump Russia investigation. Maybe the fact that the lead investigator thought Trump is an idiot and the country needs to be protected from him, influenced his judgment. The best cure is greater transparency. Above all, regardless of one’s biases, there needs to be compliance with the rule of law — compliance with FOIA. Absent compliance with FOIA and the rule of law — absent return of Ivins’ notebooks to USAMRIID — there needs to be sanctions against the FBI employee primarily responsible for the withholding. In Fall 2001, the Armed Forces Institute of Pathology (”AFIP”) had detected silicon dioxide (silica) and silicon in the attack anthrax — with a characteristic big spike for the silicon. Dr. Alibek and Dr. Bailey at the DARPA-funded Center for Biodefense had filed a patent application in mid-March 2001 involving a microdroplet cell culture technique that used silicon dioxide in a method for concentrating growth of cells. The patent was granted and the application first publicly disclosed in the Spring of 2002. Weren’t the SEMS images and AFIP EDX finding both consistent with use of this process in growing the culture? In its report, AFIP explained: “AFIP experts utilized an energy dispersive X-ray spectrometer (an instrument used to detect the presence of otherwise-unseen chemicals through characteristic wavelengths of X-ray light) to confirm the previously unidentifiable substance as silica.” Perhaps the nuance that was lost — or just never publicly explained for very sound reasons — was that silica was used in the cell culture process and then removed from the spores through a process such as centrifugation. The applicants in March 2001 for an international patent relating to vaccines were a leading aerosol expert, Herman R. Shepherd, and a longstanding anthrax biodefense expert, Philip Russell. Dr. Morozov is co-inventor along with Dr. Bailey for a patent “Cell Culture” that explains how the silicon dioxide can be removed from the surface. Perhaps it is precisely this AFIP finding of silicon dioxide that is why the FBI came to suspect Al-Timimi in 2003 (rightly or wrongly, we don’t know). The FBI would have kept these scientific findings secret to protect the integrity of the confidential criminal/national security investigation. There was still a processor and mailer to catch — still a case to prove. After 9/11, intelligence collection takes precedence over arrests. As Ron Kessler explains in the new book, Terrorist Watch, many FBI officials feel that they are damned if they do, and damned if they don’t. Outside observers are constantly second-guessing them about how to proceed rather than trusting that they are in the best position to balance the competing considerations of national security, intelligence gathering, the pursuit of justice, and the safeguarding of civil liberties. Above all, in disclosing the theory of access to know-how, the FBI has needed to protect the due process rights of Al-Timimi while he defended himself on other charges. Al-Timimi worked for SRA in 1999 where he had a high security clearance for work for the Navy. (Did he work, per chance, for James Burans? It is a small world, after all). When I emailed Dr. Bailey in December 2007 to confirm Ali had the room right near his at Discovery Hall and whether he had worked with Al-Timimi at SRA he politely referred me to counsel and took no questions. Dr. Alibek and Dr. Popov have told me that Ali is not known to have worked on any biodefense project. Dr. Popova told me I should direct any such questions to Dr. Bailey. Dr. Bailey told me I should direct any questions to University counsel. University counsel declined to answer any questions. Dr. Bailey and Dr. Alibek had the work with virulent Ames subcontracted out to Southern Research Institute (“SRI”) in Frederick, Maryland. See press releases at time using Wayback machine; 2003 telephone interview of Ken Alibek. Its President at the time, Tom Voss, and Vice-President, the influential and personable David Franz, refuse to tell me when SRI first acquired virulent Ames. True to an earlier warning, DF stopped responding to inquiries when I pressed the point. The foundation of the genetic inquiry into the 4 morphs was built on quicksand — depending as it did on self-reporting and correct assessment of the distribution of virulent Ames. Dr. Relman pointed this out in his SCIENCE piece titled “Have We Met The Enemy?” Science can be hugely misleading if the validation focuses only on statistics and implications are drawn without understanding the true crime context in which the question is framed. Until we know the distribution of Ames and what happened to the large amount of virulent Ames made by Dr. Ivins’ assistants, for example, the genetics inquiry is especially meaningless. We can’t know from where virulent Ames might have been stolen without having confidence as to where it was. All that was needed was a single door left open. People should show the same courage and forthrightness that Dr. Ezzell showed in explaining that he made dried powder out of Ames from Flask 1029 for the DARPA researchers after it had been irradiated. Most of all, the US FBI should embody the rule of law through its actions — and comply with FOIA without further delay. Although USAMRIID, the USAMRMC FOIA Officer and I first sought Notebook 4010 years ago, Ken Dillon first featured Notebook 4010 — being wrongfully withheld by the FBI — prominently in his June 19, 2015 Freedom of Information Appeal. This has remained FBI’s position even while the former FBI lead Amerithrax investigator has claimed in a lawsuit that the FBI has intentionally concealed information exculpatory of Bruce Ivins. Former FBI Agent Scott Decker notes the background of Flask 1029: “In 1997, Ivins calculated they would need ten trillion spores to complete the increase in vaccine challenges that were planned. It would take him two years to produce that amount, so Ivins contracted production to a laboratory noted for its past chemical and biological weapons testing. (Recounting the Anthrax Attacks, p. 128). The Washington Post editorial board refers to Joby Warrick’s article in its editorial. It would be hard for me — I don’t have the resources, experience or network of contacts of a major newspaper to obtain a transcript of the testimony and translate it. Such a report would not compel any particular connecting of dots; but if we face a possible biological attack by North Korea, it is a relevant background fact worth reporting. FBI Director Mueller reports that the FBI could not identify the strain of anthrax possessed by North Korea — could not turn over certain rocks abroad. In the meantime, I appreciate that Attorney Richard Lambert, in saying that the FBI is withholding a staggering amount of information that is potentially exculpatory of Bruce Ivins, thinks that there are privacy and national security constraints on disclosure, But the application of the FOIA exemptions, as a matter of law, is up to the originating agency. No exemption applies except some minor pro forma (b)(6) redactions of a proper name or two. The case Amerithrax is closed. And the FBI is not the owner of the documents that Dillon, I — and the USAMRMC FOIA officer — have been requesting for years. The Army is free to invoke a national security or other exemption with respect to the contents of any notebook, if one is applicable. But there isn’t. The notebook pages simply are potentially exculpatory of the late Bruce Ivins. And FBI is engaged in a knee-jerk CYA reaction. The US District Court should require that the FBI return a copy of Bruce Ivins’ notebook to the USAMRMC for processing under FOIA without further delay. It’s been over a half decade and the FBI’s delay is unreasonable. The FBI should pay Dillon’s attorneys fees and the individual primiarlly responsible for its withholding identified and sanctioned if there is continued withholding. At the same time, the White House should order the FBI to comply with FOIA so that the rule of law is vindicated. Who knows, maybe disclosure of the facts would remove the sheen on former FBI Director Mueller’s white knight armor. It seems that the Russia investigation is about to get ugly absent some creative “out-of-the-box” thinking on Mr. Trump’s part. As for the distinguished FBI Director Wray (who sets the same high standard as his recent predecessors), he pays lips service to the “rule of law” but then has allowed the FBI to bury Bruce Ivins lab notebook relating to Flask 1029, the so-called “murder weapon” in Amerithrax. The FBI’s concealment of the 88 page notebook violates the rule of law. I realize he has many responsibilities, and this narrow issue in a FOIA matter may have escaped his attention, but he should direct the FBI employees to return the requested notebooks to USAMRMC (USAMRIID). At the end of the day, we’re all on the same team. Who is the employee “primarily responsible for the withholding” of Notebook 4010 when I asked for it some years ago — and USAMRMC FOIA officer Sandra Rogers asked US DOJ that copies of all of the notebooks be returned to USAMRIID? Who is the “officer or employee primarily responsible for the withholding” of the other notebooks she requested be returned? (For example, the notebooks copied at the USAMRIID Library and put on a CD (or seized and not returned in 2007), would have included Notebook 4010). Who is the “officer or employee primarily responsible for the withholding” of Notebook 4010 when Ken Dillon initially asked for it — before he had to avail himself of the services of OGIS? Who is the “officer or employee primarily responsible for the withholding” of Notebook 4010 in recent months? What about the recent days and weeks after I pointed out that USAMRIID was the originating agency and long ago had asked that it be returned to USAMRIID for processing? Whenever the court orders the production of any agency records improperly withheld from the complainant and assesses against the United States reasonable attorney fees and other litigation costs, and the court additionally issues a written finding that the circumstances surrounding the withholding raise questions whether agency personnel acted arbitrarily or capriciously with respect to the withholding, the Special Counsel shall promptly initiate a proceeding to determine whether disciplinary action is warranted against the officer or employee who was primarily responsible for the withholding. The Special Counsel, after investigation and consideration of the evidence submitted, shall submit his findings and recommendations to the administrative authority of the agency concerned and shall send copies of the findings and recommendations to the officer or employee or his representative. The administrative authority shall take the corrective action that the Special Counsel recommends. Why hasn’t the Army uploaded Bruce Ivins’ Lab Notebook #4010 relating to his distribution of the Ames b. anthracis genetically matching the mailed anthrax spores that killed 5 people?